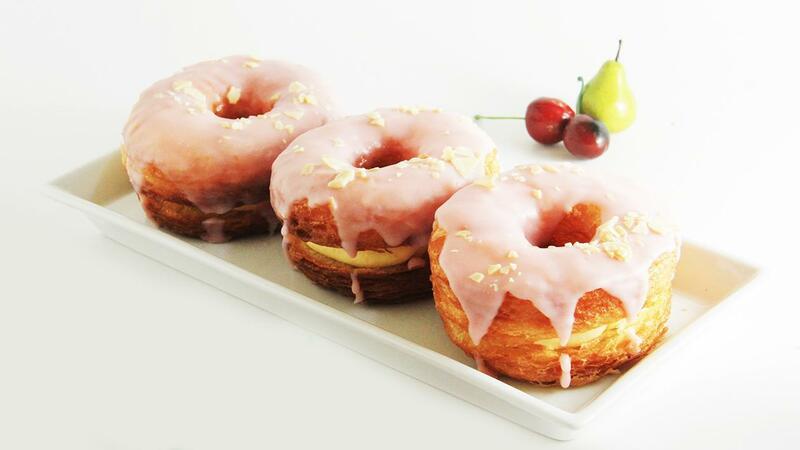 Cronut is a crunchy croissant combined with the sweetness of the donut, a new trend favourable side-dish for coffee time. Indulging side dish for your loyal customer. Whisk all ingredients for 5 minutes until it's thickened. Put the filling into a cone and keep it in the fridge. Boil the fresh cream and compound chocolate until it's boiled and turn off the fire. Keep stirring it until it's thickened. It's ready to pour on the cronut. Mix flour, sugar, instant yeast, liquid milk, water, and bread improver well. Add margarine and salt on it and whisk them well for 15 minutes until they are dough and not sticky anymore. Keep the dough in the fridge for 30 minutes. After that, take it out from the fridge. Cover it with pastry fat shortening and single covered it (see the practice 3 times). Keep the dough again in the fridge. Make the dough smaller about 1.5 cm and cut and form it into a doughnut. Fry the dough with frying oil until it's well done. Then, cut the dough horizontally and give the filling. Cover the dough and pour the mirror.